After being released in Japan, the Oppo R17 Neo makes its way to European shores as well but under a different name - RX17 Neo. 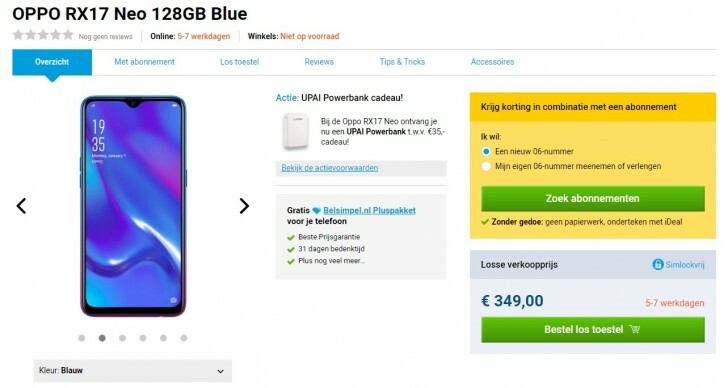 According to the Dutch store that listed the handset, the RX17 Neo is, in fact, the same device that launched in Japan the other day. As we've said before, it's actually an Oppo K1 or R15X with almost identical hardware - Snapdragon 660, 4GB of RAM, 128GB of storage, 16MP main camera on the back coupled with a 2MP sensor. The in-display fingerprint reader remains, which is the key selling point of the handset. Oppo R17 Pro is coming next week!